Emojis have a life of their own in Motorola's new campaign. Earlier this spring, the brand launched a series of short videos that envision what happens to emojis when a smartphone breaks, and today it's continuing the campaign on Twitter. This week, Motorola and agency VML are cranking out social content that features the emojis. 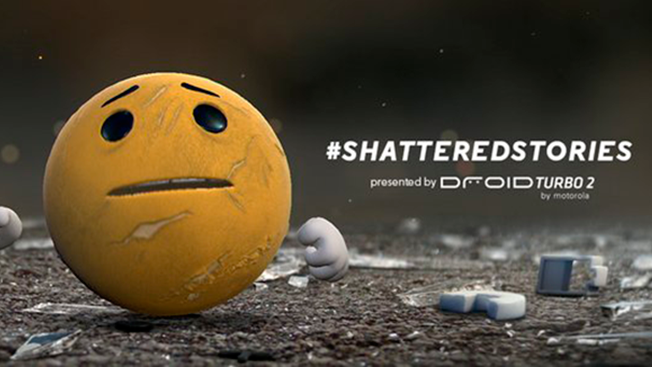 People can submit their saddest stories about shattering their phones by tweeting using the hashtag #ShatteredStories. In exchange, Motorola is putting together custom responses created from "animation war rooms" staffed with two Moto clients, 11 VML employees and nine animators and puppeteers from Passion Pictures in New York, Chicago and the U.K.
"As we thought about how to really tell the story of shatterproof in a way that is relevant and meaningful to people, the agency came to us with this idea about the world inside your phone and what happens to all of these emojis that are so prevalent and part of our everyday life," said Barbara Liss, Motorola's head of North America marketing. "We thought it was a great way to attract the millennial crowd as well as the older crowd—emojis have really become almost a universal language." Unlike some branded efforts that create content beforehand and risk coming off as stuffy, Liss stressed that her team will make all of the creative on the fly this week. In addition to the creating the content, Moto is running Promoted Tweets and giving away a few free smartphones to get people involved. Liss says she expects to create 15 or more pieces of creative, depending on how many interesting stories the team receives.